So I finally got to watching The Equalizer 2. I missed it in cinema when it came (and that sucked, because it is something I would have liked to have seen in cinema), but never mind that. I prepped myself by rewatching The Equalizer and then we moved on to this one and let me say, I was not disappointed. Definitely different from the first, but not in a bad way. Certainly not as memorable as its predecessor, but an engaging watch nonetheless. Denzel Washington is, of course, an excellent pick for Robert McCall. He slips into the role and is simply fantastic in it. The storyline is a little more predictable than I would have liked, but it in no way detracted from the enjoyment to be found here. The action is solid and keeps you hooked, and Washington struts around demanding to be seen. I appreciate how the movie has grown from what was originally created, and it changes enough to not be too drastic, but enough to not be stale. That being said, it is not a perfect movie. McCall is still trying to work with people, make them grow and realise their potential, and is now rather enterprising in his venture to help people out. There are loads of situations where I was pleased to see how he handled them, defending people who needed it. Of course we are supposed to like this aspect, but still. I quite enjoyed the humour, too, with a few good laughs in between. McCall is an interesting character to watch and follow, and so these movies are well worth it. 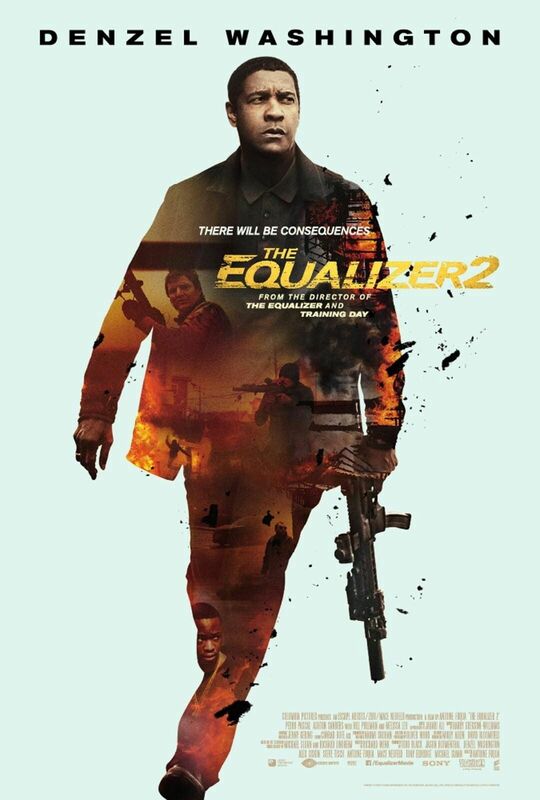 The Equalizer 2 had tons of action, enough heart, pretty solid acting (with Washington dominating as a whole) and is pretty good, though nowhere near as good as the first. This entry was posted in Movies and tagged action, Denzel Washington, movie reviews, movies, okay, Pedro Pascal. Bookmark the permalink. I enjoyed the first film and Denzel Washington is always a draw so I’ll definitely check the sequel at some point, even though it doesn’t sound like it’s as good as the first one. The first one was really good. Denzel Washington is well worth a watch here. The movie is decent but definitely flawed. Click to stay in the loop and receive notifications by email.